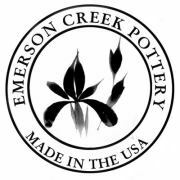 Emerson Creek Pottery has been making beautiful handcrafted pottery since 1977. Located in the Blue Ridge Mountains of Virginia, the company continues on in its tradition of making fine quality pottery for the home. Each piece is handmade, hand painted and fired in a gas kiln. The clay used to form the pottery is made on site. They currently offer fifteen different lines of ceramic pottery. Each piece is microwave and dishwasher safe, lead free and oven proof. For my review I was sent the Go Green Bud Vase. It's earthy color and lovely simplicity makes it a perfect match for any flowers you choose to put in it. It makes a sweet present for Valentine's Day or any other occasion. 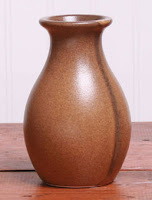 Visit the website at emersoncreekpottery.com to see their very extensive line of lovely pottery pieces all made in the USA. Which design of Bud Vases is your favorite? *Limited to US residents; 18 years old and above. Giveaway starts February 12 , 2012 and ends on February 20th , 2012 at midnight PST. Winner will be emailed and has 48 hours to respond before another winner is selected. I was not paid for this giveaway or post. The opinions on this item are 100% mine and may vary from others. The sponsor is responsible for providing the prize. I love the Pine Cone one! My house is all country! They are all beautiful! I love the Iris bud vase because Irises are one of my favorite flowers.